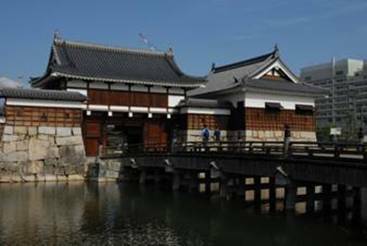 Osaka-jo was first built by Toyotomi Hideyoshi, ruler of Japan. 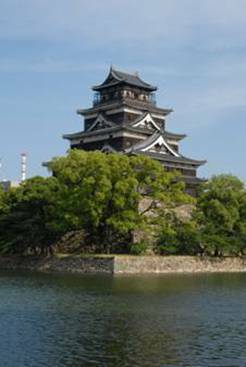 At the time of completion, it was the largest castle in Japan. It was destroyed in 1615 by Shogun Tokugawa Ieyasu, who was determined to finish off the rival Toyotomi family. The Edo Shogunate, who wanted to rid the world of anything that remotely reminded the existence of the Toyotomi family, decided to rebuild Osaka-jo from the ground up. 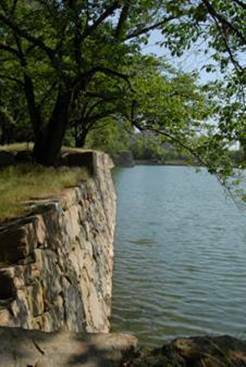 As a result, remains of the Toyotomi Osaka-jo (stone works) were buried deep in the ground, and the Shogunate Osaka-jo was built on top of it. 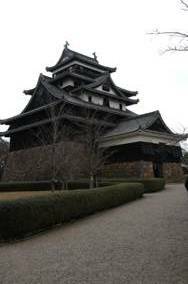 The donjon of the Shogunate Osaka-jo was second in size to that of Edo-jo, the seat of the Shogunate. 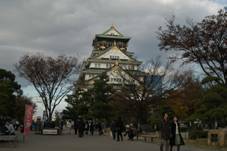 Like the donjon of Edo-jo, Osaka-jo's donjon was lost in fire shortly after its completion. 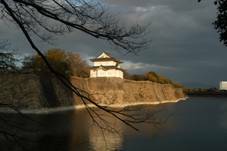 Although the castle saw no battle for two hundred years, it became the center of battle near the end of the Shogunate era. Today, centerpiece of the castle is not the corner towers remaining, but stone works constructed from gigantic stones. The current Himeji-jo was built by Ikeda Terumasa in 1601, by order of Tokugawa Ieyasu, who later became the first Shogun of the Edo Shogunate. Himeji-jo was built at the time of final struggle for the establishment of the Edo Shogunate. Therefore, it was built to repel any enemy assault. But it saw no battle in its four hundred year history. 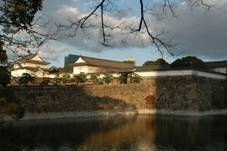 Although the entire castle complex was preserved when it became a government property after the Meiji Restoration (end of Shogun's rule) in 1867, the Meiji Government tore down many structures until they eventually realized its cultural significance. 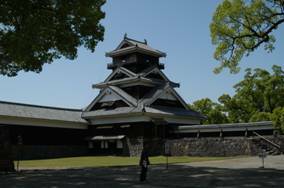 Even though the structures remaining today are only fraction of what was remaining at the time of the Meiji Restoration, Himeji-jo is the best preserved example of Japanese military architecture in the Shogun era, and the most famous castle in Japan. 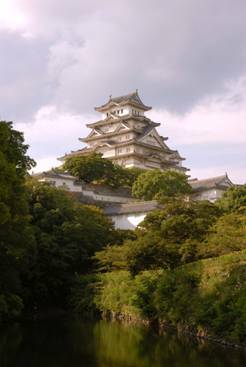 The donjon of Himeji-jo is designated 'National Treasure', and the entire castle complex is designated 'World Cultural Heritage' by UNESCO. Matsue-jo was built by Horie Yoshiharu in 1611. It took five years to complete. Retainer of the castle changed hands frequently until it was handed down to the Yuki family. All structures were torn down after the Meiji Restoration (end of Shogun's rule) in 1867, with the exception of the donjon. 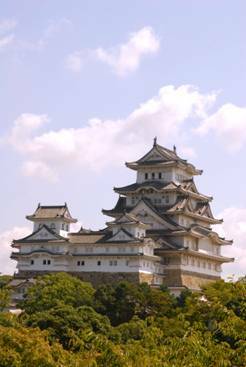 The overall height of the donjon is 30 meters, which is third among existing donjons, next to that of Himeji-jo and Matsumoto-jo. 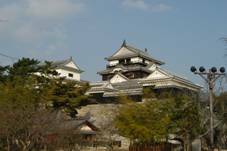 In terms of floor area, Matsue-jo's donjon is second largest, after that of Himeji-jo's. Bicchu-Matsuyama-jo was for a long time under the control of the Mori family, a powerful regional warlord. 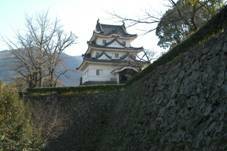 After the Sekigahara War in 1600, the Mori family was forced to give up the castle and surrounding territories. From then on, retainer changed hands frequently until the Meiji Restoration (end of Shugun's rule) in 1867. 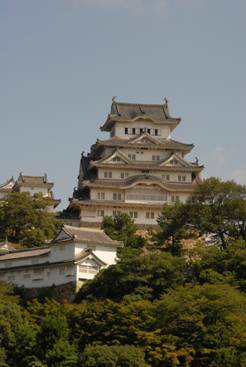 The official name of the castle is simply 'Matsuyama-jo', but there are many castles in Japan similarly named 'Matsuyama'. For academic purposes, former province name (in this case 'Bicchu') is added as a prefix for differentiation. Construction of Magugame-jo began in 1597, and was completed in 1602. 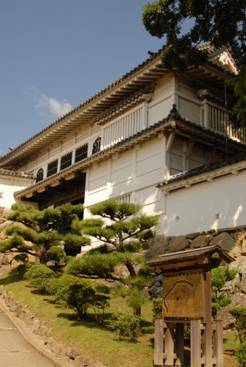 But in 1615, it was demolished because of the 'Ikkoku Ichijo Rei (one castle per province law)'. Magugame-jo was rebuilt by Yamazaki Ieharu in 1641. 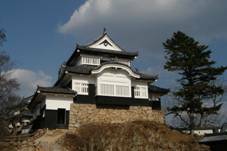 Major feature of this castle is that the entire Kameyama hill, nearly 60 meters high, is covered with stone works. Iyo-Matsuyama-jo (Matsuyama is a common name for a castle, so for academic purposes, differentiation is made by adding former province name as prefix), was constructed in 1602 by Kato Yoshiaki. 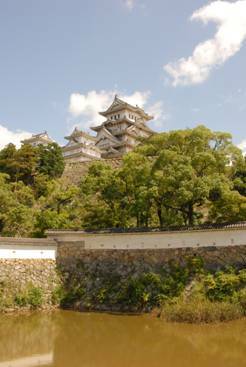 Yoshiaki desperately wanted to build a castle in Katsuyama hill. 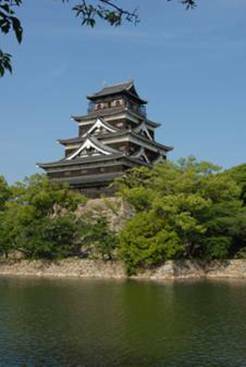 Knowing that the Shogunate will never permit construction in Katsuyama if requested first, Yoshiaki listed Katsuyama hill as an alternate location for a new castle. The Shogunate, as Yoshiaki expected, rejected the first site proposed and permitted construction in the alternate location. Donjon, when it was first completed, was five stories tall, but it was later renovated to three stories. 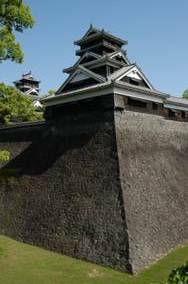 The official reason was that the ground was too weak to support a five storey structure, but in truth, it was scaled down to escape the constant watch of the Shogunate, suspicious of any warlords with grand castles (i.e. with enough financial and military powers to overthrow the Shogunate). Matsuyama-jo faired well against the Meiji Restoration (end of the Shogunate) and the Second World War, but many structures were destroyed in 1949 by an arsonist. Uwajima-jo was constructed by Todo Takatora, and was later renovated by Date Munetoshi who became the lord of the province. Current donjon was built during this time. Only structure remaining is the donjon. 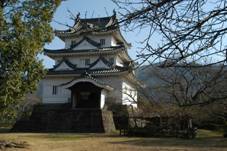 Ehime prefecture is noted for castles with donjons remaining. There are two (the other is Iyo-Matsuyama-jo). This is rare, because most prefectures have not a single castle with donjon remaining (there were many castles with no donjons built in the first place; this was done to escape the watch of the Shogunate, suspicious of any warlords with grand castles). Kochi-jo was built in 1603 by Yamauchi Kazutoyo, on Otakasakayama hill. Majority of the castle was destroyed by fire in 1727. The castle was rebuilt completely in 1753. Structures currently remaining in the central keep are from this reconstruction. 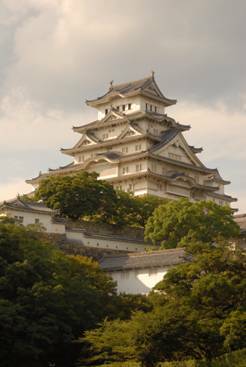 In 1873, all structures within the castle was demolished, with the exception of the Otemon (main gate) and the structures of the central keep. 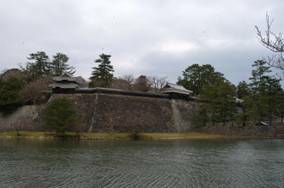 Kochi-jo is presently noted for the fact that is it the only castle in Japan with all structures in the central keep remaining. Kumamoto-jo was constructed by Kato Kiyomasa in 1601. 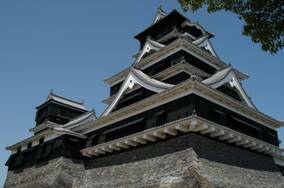 Kiyomasa, a powerful warlord, built Kumamoto-jo not only as the seat of his government, but as a fortress for a major battle. As a result, Kato family came under a constant and suspicious watch of the Shogunate. The Kato family was eventually discontinued. Kumamoto-jo was retained by the Hosokawa family until the Meji Restoration (end of the Shogunate). Majority of the castle structures remaining was destroyed in the Seinan War, started by Saigo Takamori. Takamori, although a key player in bringing the end to the Shogunate, was dissatisfied by the new Meiji government which he helped to create. He started a war along with other former samurais, but was defeated by better equipped Meiji forces. 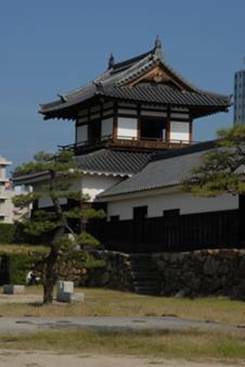 Udo-yagura (Udo Tower), one of the few structures in the castle still remaining. (proved untrue by recent investigation). Hiroshima-jo was constructed by Mohri Terumoto, a major warlord of the region. But after the Sekigahara War (the War against Tokugawa Ieyasu (East) and Toyotomi family (West)), Hiroshima and the surrounding region was confiscated since Terumoto sided with the West in that war. Hiroshima-jo's was awarded to Fukushima Masanori, who had long sided with Toyotomi family, but allied with Tokugawa Ieyasu just before Sekigahara. This shift encouraged other warlords to change sides, which lead to Ieyasu's victory. However, Masanori's rule did not last long. 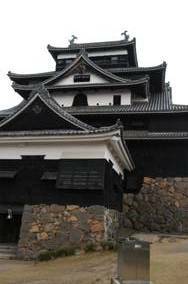 He was accused of repairing the castle without the Shogunate's permission (the Shogunate strictly prohibited construction of new castles, and demanded permission for any repairs or refurbishment), and was soon dismissed. 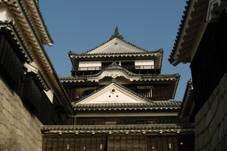 The castle was then awarded to the Azano family, who ruled Hiroshima until the Meiji Era. Donjon remained standing up until World War II. When it was just about to survive the war, it was blasted to pieces by the detonation of the first nuclear weapon in history, the Little Boy.